Thanks to my husband who went to a Lutheran school in the 70's telling me how much he loved his science book, I've stumbled upon a science curriculum that Christian home-schools and parochial schools should check out as everything in it is from a Creation perspective. It's the Rod and Staff Science program and covers 2nd through 10th grades. Check it out and if nothing else, this curriculum would be a great resource for Christian school teachers as an example of how to teach all of science from a creation-centered perspective. God created this world for us and we are seeking to understand it better. Science, at this level, mainly involves identification. Such subjects as seasons, seeds, wildflowers, weeds, trees, mammals, insects, songbirds, and the celestial bodies are introduced on the child's level. Units cover water; solids, liquids, gasses; the seasons; heat and cold; care of the body; animals; farming, machines, stewardship. 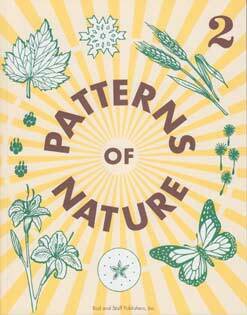 The theme of the book is God's care of man and nature. The Bible theme identifies scientific facts that relate to the story of Noah. Students will study weather, animal life, star constellations, light, electricity, plant life. Health and safety are addressed in a unit on human disease and in some lessons such as the lesson on the eye. References from the Book of Job help establish the theme of the book. Students will learn the basics of orderly, scientific study. God's wonderful world is best understood by careful observation and by consistent testing of one's conclusions. They will observe God's power and control, study and classify various forms of life, and become acquainted with practical applications of everyday science as well as the value of conserving God-given resources and the value of observing safety. References from the Book of Psalms help establish the theme of the book. Students will learn about the solar system, energy, food chains, electricity and magnetism, body systems and health, and the earth with its support of life. 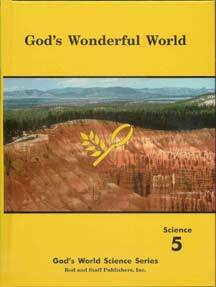 The book theme, "God's Inhabited World," strongly emphasizes how God designed the earth for life and designed life for the earth. The spiritual tone is drawn from the Book of Isaiah, and the values of good stewardship are emphasized. Students learn the laws of energy and motion as well as integumentary, skeletal, muscular, circulatory, lymphatic, and excretory systems, nutrition and digestion. They also learn about backyard stargazing and deep-space objects, heat energy; weather and weather forecasting; the nervous system, the senses, and the mind; health, safety, and basic first-aid procedures. Students will learn the principles of light, including color, optics, and the eye, work and machines, energy and engines, principles and applications of chemistry, electricity, magnetism, generators, motors, circuits, electronics, and electrical safety as well as an introduction to reproduction and heredity. Closer look at God's Orderly World, Grade 7. 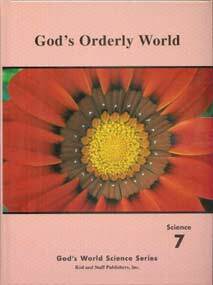 "God's Orderly World frequently shows the orderliness in the laws and designs of God's Creation. Another goal is to help the student understand the error of false science and how to guard against losing Biblical faith." Unit 1: What Is Science? I truly did love that series. It kindled in me a a love for the many subjects in science, and it developed a great respectful awe and appreciation for the wonders of the physical world. And most imporantly, at a time when my faith was being challenged by attempts at naturalistic explanations of life, the universe and everything, this curriculum strengthened my faith in the Almighty Creator God. I came away with confidence that the complexity in simplicity all around us didn't spontaneously develope but was intelleligently designed by the loving, all-powerful, all-knowing, incredibly creative Lord God of all.